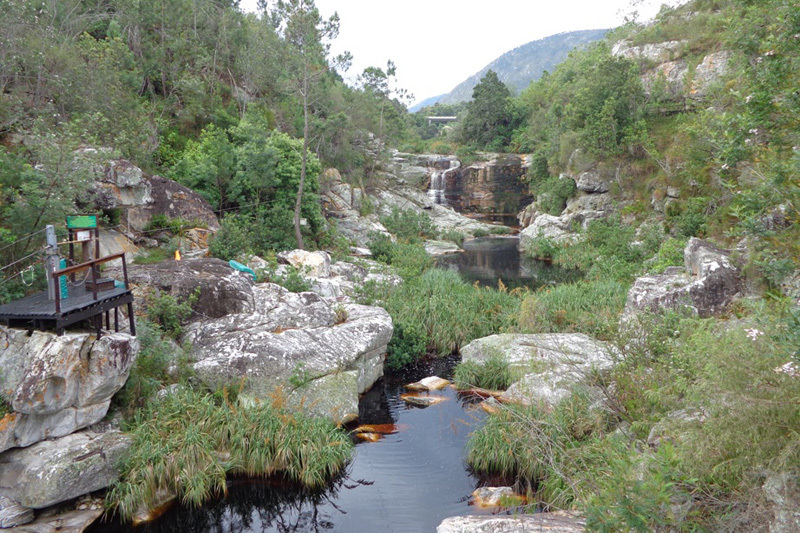 There are so many different ways to take in the beauty and splendour of the Garden Route and Tsitsikamma, and ziplining waterfalls tumbling into the black waters of the river below is certainly a novel experience. Tsitsikamma Falls Adventure is situated on the N2, clearly visible from this main thoroughfare by its bright orange roofs. We arrived for the first tour of the morning at 08h00. The attentive staff members were very quick in getting us into our safety harnesses, helmets and gloves. We were also each given a bottle of ice-cold Tsitsikamma spring water on a very hot morning. We underwent a quick safety brief and were then sent on our escapade over the waterfalls with our tour guide, Lorenzo. There are eight ziplines of varying lengths and speeds. The longest is an impressive 211 metres long, close to a quarter of a kilometre! The longer the line, the more speed you accumulate, making some of the trips over the river quite heart-stopping and adrenalin-inducing, while others are more relaxed, giving you time to admire the natural beauty around you. Lorenzo was thorough in preparing us for the speed and length of each line and for when and how to brake on each. This made us feel more confident when leaping off the platform with nothing for metres below us. There is a suspension bridge over some of the deepest water, which is an astounding 20 metres deep in places. Crossing over the swaying bridge is, in itself, exciting, but also offers stunning views at a slower pace. This is also a great opportunity to chat to the guides and ask them questions. They know this area like the backs of their hands and are, therefore, able to add a lot of insight to your Tsitsikamma experience. The guides take their own camera and then provide photographs (at a fee) of your personal ziplining tour on a DVD. The guides are alert to photo opportunities, ensuring that they capture the best parts of your experience as a happy memory. 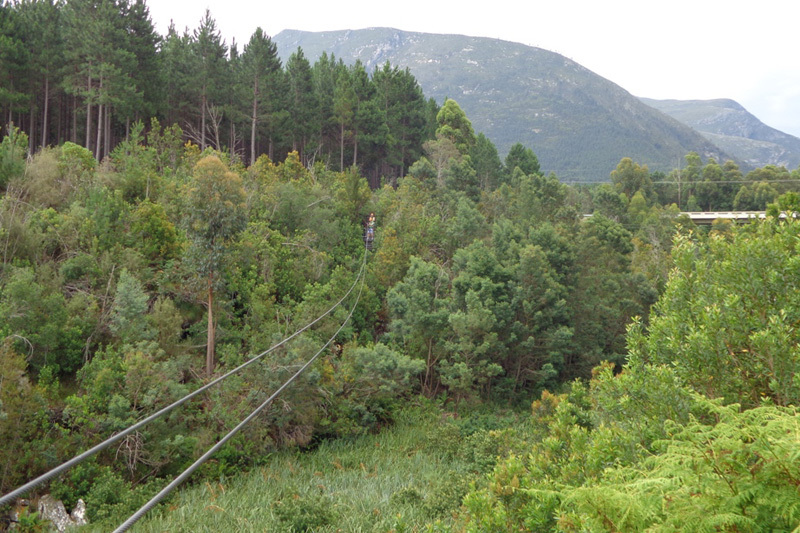 Tsitsikamma Adventures also offers abseiling, which is a descent of some 36 metres into a picturesque fern cove below. These two experiences can be combined in a package option for those wanting to test their limits and get their adrenalin pumping.